The flow of money inside Spring Creek Correctional Center in Seward and the way it’s used to meet community needs is surprisingly similar to the world outside of the prison walls, even down to the donut sales to raise money for a good cause. At the heart of that economy is the prison store, where inmates can buy everything from $1 frozen burrito to a $15 bag of coffee along with bars of soap and new underwear. Think of it as the one store in a small Alaska village. The profits from the store are distributed to seven different prison clubs. Think of them as nonprofits, each with a different focus. The Time Club supports educational opportunities. The Alaska Native Culture Club offers sweat lodges each week. And the Bonsai and Horticulture Club grows plants. The club did focus on bonsai trees years ago, but then the administration banned indoor plants with dirt in them. He started growing them for the guys in segregation. 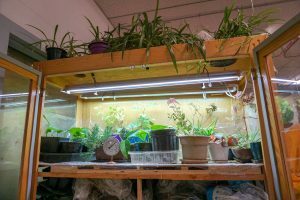 He hands out two-inch cuttings and some grow to multiple feet. He’s been to seg before, he said, and a little bit of life can really improve things in the small, bare, concrete rooms. Now he’s growing plants for every inmate who wants one. As soon as he has enough for each man in a housing unit, he distributes them equally. Crawford’s plants are just a small example of what the clubs do. Each club has a pool of money from their share of the store’s profits, and they use those funds to improve the lives of the inmates. Sometimes that means buying communal property, like weight machines and guitars. One club provides scholarships to inmates, so they can take college classes. Other prisons in Alaska have clubs and each gets funding from a different source, like a surcharge on commissary items or cable TV. Spring Creek is the only institution that offers shares in the prison store. Lawson said he took on a leadership role because the community inside the prison walls is just like the community on the outside; it needs people who are willing to give back. He explained that he’s an elected official, like local government leaders, and he has to earn the prison community’s trust to win votes. The Brotherhood of Alaska buys games and chairs for the visiting room and helps put on banquets for inmates and their families. For Christmas, they purchase gifts for every visiting child who’s under 16. The events can cost thousands of dollars, which the clubs don’t always have in their bank accounts. Other clubs need short-term loans for immediate, unexpected needs, like wires for the weight machine. “If we are short money, we go to the other clubs and we beg, borrow and… not steal but beg and borrow,” Lawson said. 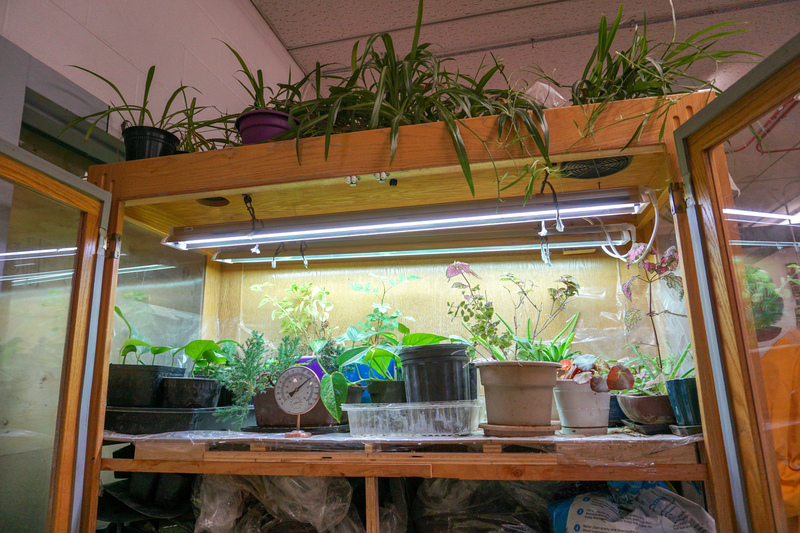 Some clubs, such as the Bonsai Club, don’t have to buy many expensive items. They mostly pay for garden and yard care once per year. So they’ve agreed to keep a cushion of money to help fill the gaps. They’re like a charitable bank that offers no interest loans. If a project requires more money than clubs can earn through the store, then they sell donuts or high-quality shoes as fundraisers. If they have extra money, the club leadership will talk with their membership and sometimes choose to donate it to causes outside of the prison, like research for Cystic Fibrosis or the local wrestling club in Seward. 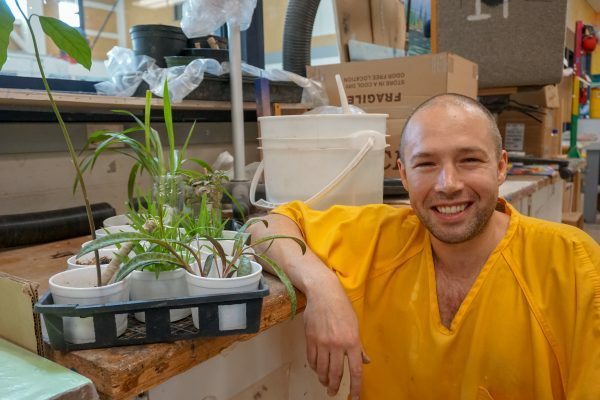 They know that all communities are interconnected, and healthy communities lead to healthy people, like Crawford, the plant guy. Crawford didn’t enter Spring Creek as a philanthropic horticulturist. Lawson’s known him for years and said he used to be a little rough around the edges. In part because of the opportunities for growth offered by the clubs. Next week on the Solutions Desk we’ll be talking about another club project — the hobby shop — and how that feeds the prison’s economy and it’s soul. Want to make sure you don’t miss it? Subscribe to the podcast on iTunes, Stitcher, or NPR.